b. 25 Dec 1840, Kings Heath, Kings Norton, Worcester. William HUMPHRIES was born in Berkswell, Warwickshire in 1838 but lived almost all of his life in Aston, Birmingham. His father, Charles HUMPHRIES, was a blacksmith so it was an easy step for William to become a brass founder and worker. Brass was one of the four main industries of Birmingham during the 19th century, along with guns, buttons and jewellery. It is estimated that by 1870 10,000 workers were involved in the brass trade alone. 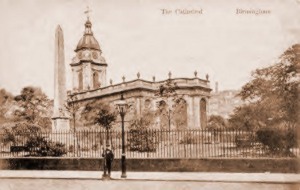 In 1860 William married Ann EDWIN in St. Phillips Church, Birmingham. In 1863 William and Ann's first son Walter died at the age of 3. In 1878 their second daughter Amy died at the age of 10 years as a result of burns suffered from falling into the fire place. Sadly this was a very common cause of childhood death in those Victorian times of large open fires and long dresses. By the time of the 1881 census William & Ann HUMPHRIES are living with their surviving five children in Darwin Street, Aston. William gives his occupation as 'brass founder', while Ann is a 'screw worker'. By the 1891 UK Census they have moved to Charles Henry Street in Aston and we wonder if it was the birth of their illegitimate granddaughter, Beatrice HUMPHRIES, that prompted the family's move. By 1891 William & Ann's eldest daughter, Ann Maria is now married to Albert Jennings but it seems this couple were never to be blessed with children. William & Ann's youngest daughter, Matilda is boarding with a family in High Street, Aston, while Matilda's daughter, Beatrice is still living with her grandparents in Charles Henry Street, Aston. Beatrice Humphries continued to live with her grandparents until their deaths in the 1890s. After that she became part of her uncle, George Humphries', household and worked as a Warehouse girl. She was known as Aunty Beatty to her HOBAN half brothers and sister. The secret of Beatrice's birth was only revealed on her mother Matilda's death bed. By the 1901 census sadly William and Ann Humphries have both passed away and the remaining, unmarried Humphries children are now living with either their brother, George Humphries and his family, or their sister Ann Maria Jennings and her husband in Aston. Matilda is now married to Edward HOBAN and they have moved their family to live to the Selly Oak area of Birmingham where they remained until their deaths, in 1929 for Matilda and 1941 for her husband, Edward. William & Ann's youngest son, Charles (Charley) Humphries, was a very quiet man and a traveller. He never married and lived the last few years of his life with his niece, Matilda POWELL nee HOBAN and her family in Blossom Avenue, Bournebrook, Selly Oak, until his death in about 1945. Amy died on the 7th of November 1878 from burns caused by her clothes catching fire after she climbed up on the fire grate to get to the mantle above. She was just 10 years old. She died in Queen's Hospital, Bath Row, Birmingham. An inquest was held on the 9th of November 1878. Such accidental childhood deaths were, sadly, very common in 19th century England. Married: 22 July 1892 St Andrew's Bordesley, Birmingham.